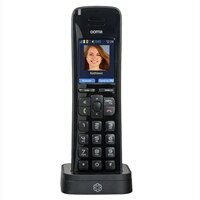 Ooma HD3 HandsetDouble the fidelity of your phone calls with HD Voice. Get caller-ID and sync online contacts and pictures with Facebook. Get an Instant Second Line and make or take a second call, even when the Telo is in use (Premier customers only). A 2-inch color display provides the ability to display pictures of contacts. Displays a picture of the caller as the phone starts to ring along with caller-ID information. The device also automatically syncs with Facebook profile pictures. Use the intercom to talk between handsets and transfer calls – this feature can also double as a baby monitor. Ooma HD Voice technology doubles the fidelity of your phone calls by capturing twice the speech information of a standard voice call (yes, that includes your landline). When you and another caller use an Ooma handset, or any HD-compatible phone, your voice will sound more natural. Double the fidelity of your phone calls with HD Voice. Get caller-ID and sync online contacts and pictures with Facebook. Get an Instant Second Line and make or take a second call, even when the Telo is in use (Premier customers only).